Image Credit: Evidence for ESSA. A new website launched by the Johns Hopkins University Center for Research and Reform in Education (CRRE) offers insights into K–12 reading and math programs. The website provides up-to-date and reliable information to help education leaders better understand how these programs compare under the Every Student Succeeds Act (ESSA). Math and reading platforms can be searched by elementary and middle/high school levels. 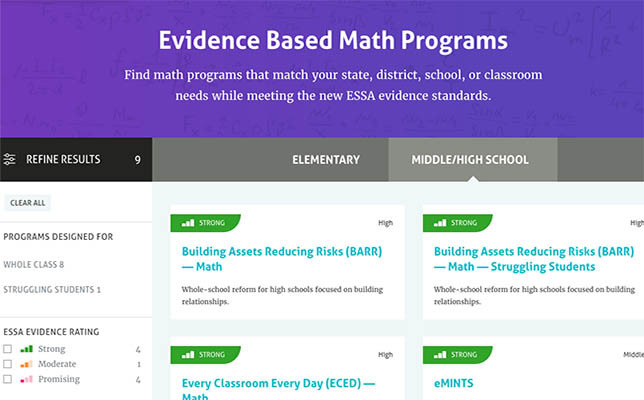 For example, users can lookup a math program specifically for the elementary school level to see whether it meets the new ESSA evidence standards. Programs are ranked using language found in the law — either “strong,” “moderate” or “promising,” depending on the quality of their ESSA alignment. An array of features, including cooperative learning, family engagement and more. Director of the CRRE and School of Education Professor Robert Slavin told The Hub that the website functions as a consumer report of sorts, with an overall goal of helping state chiefs, district superintendents, principals and other education leaders determine how vigorously a program has been vetted. "But there are many other people — parents and teachers, for example — who could use this information to advocate for particular programs that they think would be better for their kids. And we hope they will," Slavin said. The Evidence for ESSA website is now live.